Celestin Mezanie, 44, right, poses for a photo with his wife Magnis Volay, 35, inside his house at Corail-Cesselesse, Haiti, a camp for people displaced by the January 2010 earthquake, on the outskirts of Port-au-Prince. 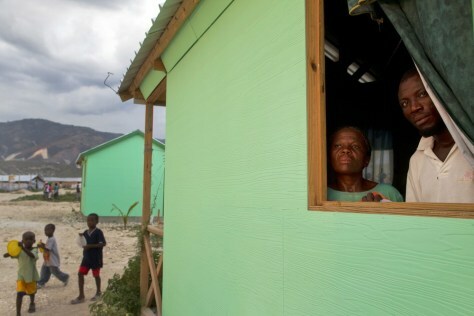 Some 18 months after the quake, Haiti's government is focusing on redeveloping the countryside to relieve strain on the crowded capital. Officials hope the lure of jobs and housing across the country will help advance longstanding plans to more evenly spread out the country's population.